“Assassins” is one of Stephen Sondheim’s masterpieces, and an excellent example of the power in dark comedy, as well as musical dynamism. Music and lyrics are by Sondheim who based the story on an idea by playwright Charles Gilbert, Jr. and the book is by John Weidman. The story revolves around a gathering of historical presidential assassins, successful and unsuccessful, meeting in a public place which may be evocative of the most depressing aspect of societal institutional interaction-the Department of Motor Vehicles. Because the show reflects the motivations ascribed to the murderers in their madness, “Assassins” is a somewhat controversial production. This is a show that may not be appropriate for all audiences. An appreciation of dark comedy and a well-developed sense of humor are essential to appreciating the play. Sensitivity in presentation is equally vital, recognizing that is important for patrons. 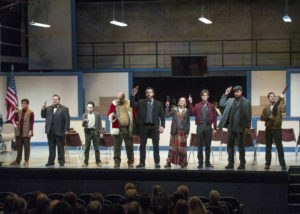 This was clearly at the forefront of Producing Artistic Director Michael Baron’s mind when Lyric decided to include “Assassins” in this season. Baron handles the direction, and he does so brilliantly. Every song is new and delivered with uncanny aim. Every singer is an actor handling the song with devastating certainty and the weapon with deliberation. Baron not only cast “Assassins” brilliantly, he uses a crew with sensibility in their operation. Further, he wisely utilizes the expertise of H & H Shooting Sports as the Firearm Education Sponsor H & H is one of the most knowledgeable and safety conscience businesses dealing with firearms to be found in the area. Clearly shots will be fired, of course from a blank, but it is not one bit musical. However, Musical Director David Dabbon and the entire orchestra bring intensity to the musicality that is beautiful, expressive, and makes each firearm discharge a contrast that is just a little jarring, as it should be. The wonderful cast stars Matthew Alvin Brown as both the Balladeer and Lee Harvey Oswald. In 1963 the face of Lee Harvey Oswald became imprinted upon the memories of everyone in the United States with access to a television. That face is now slightly blurred as the features of Brown overlays the visage of Oswald. Our understanding of motive is increased, but our anger toward Oswald is not appeased by Brown’s performance. It is a wonderfully wrenching performance but appropriately not an inspirational one. The face of John Wilkes Booth is based upon blurry photos from old newspapers and illustrative renderings, but now that face is clear and firmly entrenched. It is the face of Mateja Govich, and it is diabolical. Fortunately Govich has greater acting ability than Booth is reputed to have, because he will be able to overcome it. President James A. Garfield’s assassin is Charles Guiteau, and he is not in the forefront of our imaginations as Oswald and Booth, until now. Justin Larman gives Guiteau a voice and a face that cannot be forgotten and will send us to the library to read up on the Garfield administration and the unfortunate culmination. Larman reveals Guiteau’s enthusiasm for living along with his dark view of life as a magnificent dichotomy that is haunting. Sara Jane Moore and Lynette ‘Squeaky’ Fromme, (a Charles Manson devotee) unsuccessfully attempted to assassinate Gerald Ford. Their faces have also become superimposed upon the eyelids of many patrons by the faces of the actresses portraying them. The two made their attempts within three weeks of one another. (Ford is considered somewhat bumbling, but, his attempted murderers were apparently even more inept.) Lyn Cramer’s portrayal of Moore is one of the most amusing portrayals found in “Assassins” and her devotion to emotional integrity makes her profound recognition of Moore accurate, though the play is not intended to be a historically factual account. Emotional accuracy can be a key element in understanding historical events and Cramer’s brilliant performance is a perfect example of emotional truth. Natalya Ferch plays Lynette ‘Squeaky’ Fromme beautifully. Fromme was not a part of the Tate/La Bianca murders, yet her attempt on Gerald Ford’s life in September 1975 caused America to relive the horror of the 1969 Helter Skelter events. Ferch’s natural performance of a young woman who could have been someone’s sister is witchery. Through song and nuance Ferch gives Squeaky substance and empathy. That makes her journey into unfathomable evil even more horrifying. In 1901, at the Pan American Exposition, Leon Czologosz assassinated William McKinley. Czologosz was an anarchist from a destitute immigrant family. In his childhood he suffered a mental breakdown and never recovered. His face is also unforgettably Greg White, who portrays him with great emotional integrity. It may be impossible to ascertain the accuracy of an emotional derangement suffered by someone who has been gone for over a century, but it is quite possible to determine the desperation that brought about the event. Greg White is not a desperate actor, so the Czologosz expression and performance will not follow us. Only the desperation and insanity White’s displays will inhabit our nightmares. Franklin D. Roosevelt is remembered as one of our greatest presidents. Just before taking office for his first term, Guiseppe Zangara leveled a pistol at FDR. Due to bystander intervention the bullet went wide and Anton Cermak, Mayor of Chicago, ultimately died from complications. Justice was swift and Zangara died in the electric chair a few months after the event. Ryan Blagg seems to almost channel the complicated emotional disarray that constituted the reasoning behind the assassination. His resemblance is uncanny and his understanding is most canny and shocking. 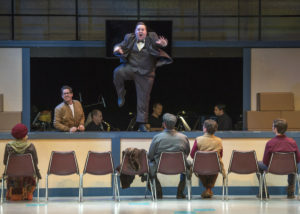 Another outstanding performance cements Blagg as an actor and singer of note. Richard M. Nixon is one of the most maligned presidents in recent history. Few even recall the attempt on his life made by Samuel Byck. Anyone hearing the tapes he made detailing his plan and reasoning would recall it with chills. Even more chilling is to watch D. Lance Marsh making the tapes in his portrayal of Byck. Byck did not attempt to shoot the president; he shot the pilots of the aircraft he was hijacking to fly into the White House. Then, after a shootout, he used his gun to suicide. His madness is made more than chilling by the Marsh interpretation. Once again clarity of purpose is revealed and Marsh creates a connection that wishes to harm and a warning to those who protect that is almost prophetic. The news filmed the attempt upon Ronald Reagan and it is clear and calamitous as we watch James Brady bleeding upon the sidewalk, while Reagan is hustled away into the car. We see the secret service agent grab his belly as others in the service wrestle John Hinkley Jr. to the ground. All this to impress a pretty girl. Reagan overcomes the attack, the pretty girl is remembered best as a great actress, not an insane reason to murder, and Hinkley, himself, seems to have overcome his madness in the nearly 40 years since this happened. In 1981, the youthful face of the young Hinkley is recreated now by Mark Jammal. Strumming a love song on his guitar he pleads with his lady love to notice him and it is tempting to reach out and shake some sense into the tortured soul. Jammal shocks and secures a place for Hinkley in the arms of loveless loving and the triumph of victims. The duet between Ferch and Jammal is particularly evocative of crazed youth. Strolling among the potential assassins at the DMV is the Proprietor. He provides much of the comic release in the show with affable disinterest. He seems to anticipate the requirements of each assassin, and assists providing props and weapons with a delicious smirk. Vince Leseney makes him comfortingly menacing as well as amusing with skillful mockery. “Assassins” is a play full of inspirational performances—without inspirational personas. In creating a bridge to understanding these tragically despicable mad characters, the company has played a different card. Anyone who sees this production will never wish to shoot the President or anyone to make a point. It’s pointless. “Assassins” plays at the Lyric Theatre of Oklahoma in the Plaza Theatre located at 1727 NW 16th St. in the Plaza District. Plenty of parking is available in the parking lot for Lyric’s Administrative Offices at 1801 NW 16th, just a short walk. Curtain is 8:00 pm Friday and Saturday nights with a Sunday evening matinee at 5:00 pm. Patrons attending during weekday evening performances (Wednesday/Thursday) should note that the curtain is at 7:30 pm rather than ½ hour later. For information and tickets visit www.lyrictheatreokc.com or call 405-524-9312.